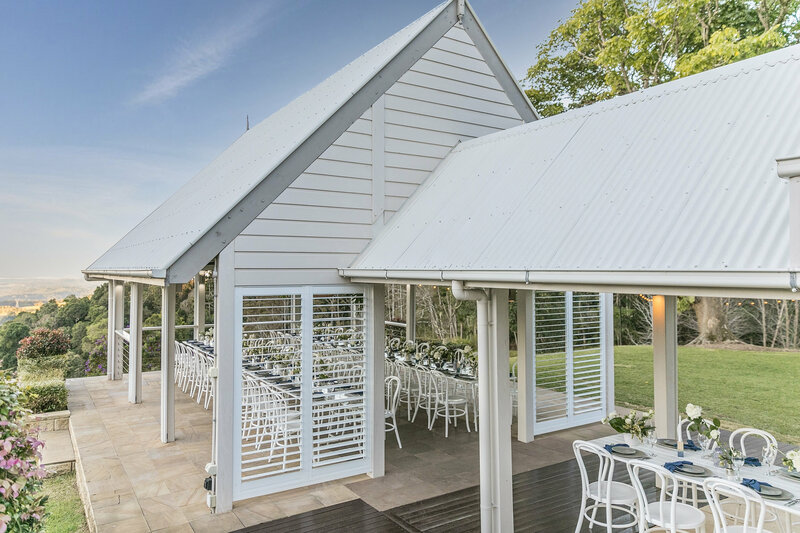 Come and be swept away on a summers nights dream..
A touch of elegance on our white pavilion kissing the edge of the valley to the Sunshine Coast, with views to Mt Coolum and Noosa over our rainforest valley. Flow through the whole estate in a variety of spaces or rooms in style. 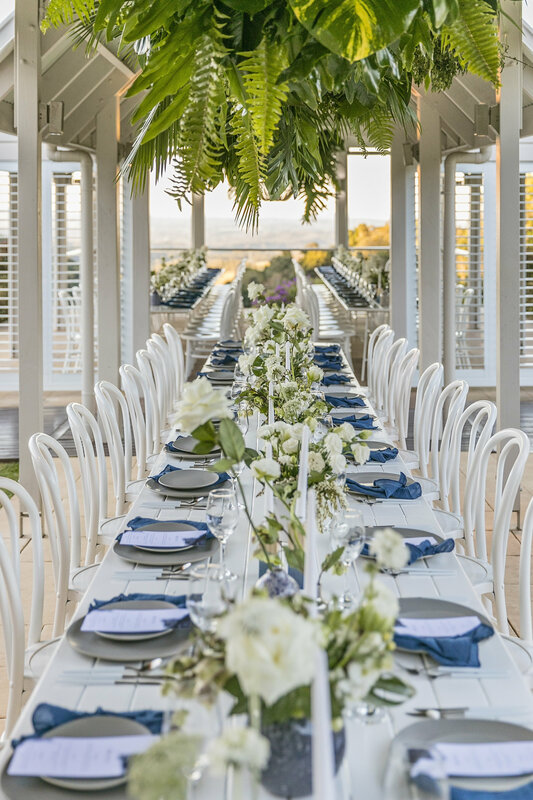 Fresh Hamptons styling, bountiful foods, plus professional assistance… so the concept, planning and setup is seamless. 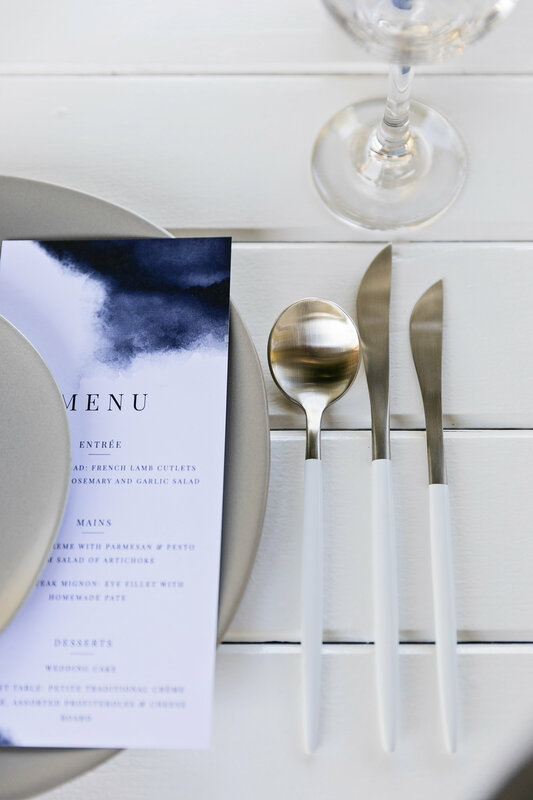 A vision of styling and florals to add all the luxury elegance you could imagine outdoors but undercover with a much more relaxed style of summer time dining on the edge. Start on the plateau, move to the pavilion and garden party with a glass of bubbles in hand, flowing through the whole venue and the grand finale the “Supper Club” and dance time inside the Manor with the indoor/outdoor bar. 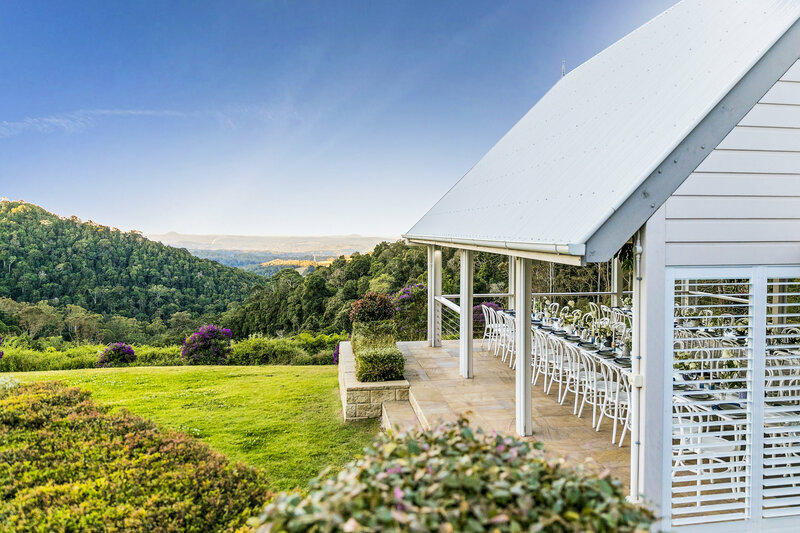 We have a team of Maleny Manor Mentors to guide you through all the processes and assist you with full style briefings, unique florals, hand crafted foods and beverage, service you desire and a coordination team with you each step of the way. 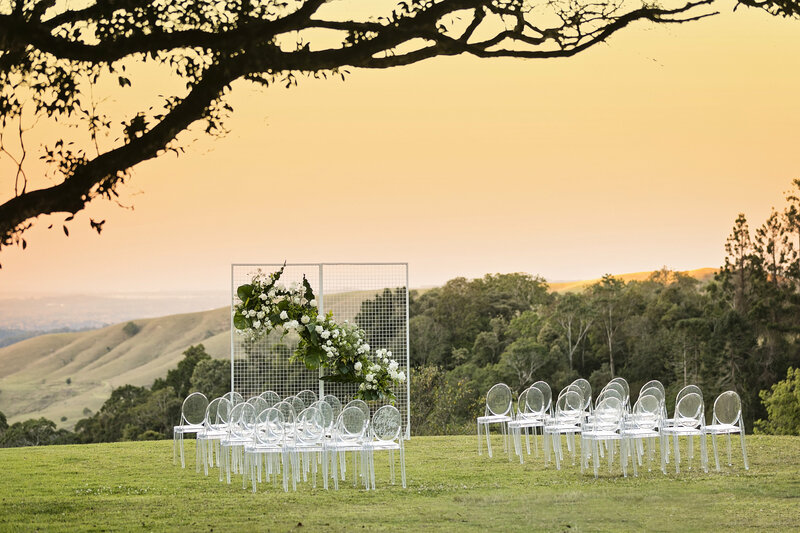 giving you so much more than the wedding of your dreams! Our Style Team is Love Bird Weddings and a complimentary Styling Proposal is included in this package valued at $600. Our Floral team is Mondo Floral Designs who offer complimentary in studio, floral consultation in this package. Tuscan Table mezzo platters – salami, sundried tomatoes, marinated green olives, pecorino cheese, pesto dip, baked ricotta wedge, virgin oil and sliced crusty bread. Oyster plates – fresh oysters and oyster mornay. Hand rolled vegetable spring rolls, Thai Chicken Skewers with satay dipping sauce, Beef Samosas with mango chutney. Whole roasted Eye fillet and red wine jus with seasonal vegetables with warm olives and feta tuscan salad and hand cut chips with rosemary salt and aioli. Pancetta wrapped spatchcock with roasted kipfler potatoes in duck fat with thyme and lemon, mixed leaf salad with baby cos, parmesan and garlic croutons. Our handcrafted famous Potato Gnocchi with butternut pumpkin, sage balsamic and hazelnut butter and a salad of rocket, shaved pear, caramelised walnuts and blue cheese. Spice Rubbed Slow Roasted Lamb shoulder, flatbreads with tzatziki and tabouli. Chatz Potatoes and a Moroccan Chick Pea Salad with olives, bocconcini and roasted peppers. Grazing Dessert Buffet with gourmet cheese board, Individual creme brûlées, Manor chocolate brownies, rainbow macaroons and add your wedding cake. Grazing Dessert Buffet with gourmet cheese board, Individual creme brûlées , Manor chocolate brownies, rainbow macaroons and add your wedding cake.